The world's lightest modular rubber speed bump! Will never chip, rot or corrode. Made of Recycled PVC, its flexibillity allows it to contour to road crown. A standard speed bump system section includes (2) main pieces, (2) endcaps x 5” long and (1) connector clip. Main pieces may be added and connected to form larger units. 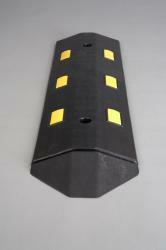 EndCap: 5” Safety Snap On End Cap - sloped modular profile prevents tripping by pedestrians. Yellow Plates: Each speed bump section is embedded with (6) yellow safety plates of weather resistant, composite material for protection from salt, freeze and thaw. Can be used as a cable cover - bottom sides include 1” x 1½” channels for protecting temporary or permanent cables or hoses. Residential indoor garages - great vehicle stopper!